This hasn’t suddenly changed to a food blog, it remains about my travels and I am still at the Eden Project in Cornwall. The second biome mimics a Mediterranean climate rather than the rainforest. On entering, you see a mosaic on the floor representing olive oil flowing down the hill and an obelisk where it collects into a bottle. 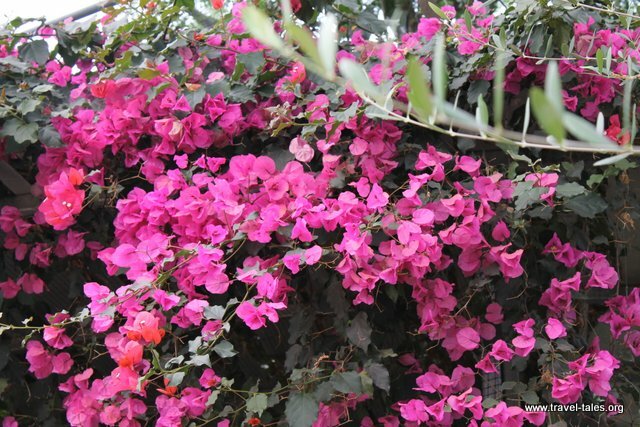 Overhead are wonderful bougainvillea flowers and other pink blossoms alongside the path. The art here continues with these fighters dotted around the chilli plants. There was a chilli tasting station at the edge of the planting and I discovered Lemon Drop Chilli – which has a great combination of lemon flavour and chilli heat. I managed to find some seeds in one of the shops at the Eden Project and hope to plant some next spring.